The rewards are as follows – and all of these are in addition to the normal Red Beans you’d receive anyway. For those of you who buy your Red Beans with Euros instead of US Dollars, the rewards correspond to the same Red Bean packs. To check out the rewards, see our Warpaints Guide and Glider Pads Guide – we’ll be adding the Vapor LGV to our Vehicles Guide ASAP. Note that despite the advertising material’s text and art, the glider pad is the Sunrise glider pad, which is different from the Sunset glider pad available with the previous Red Bean bundles – although they do share a cooldown. 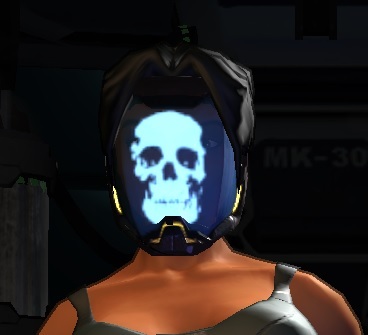 It’s in the “Head Gear” category in the New You, and is basically exactly the same as the existing “Astrek Full Mask” item (which is available for 80 Red Beans), with the addition of a holographic skull on the faceplate.